As the frost melts off the grass outside my window, I think of the hot summers and even hotter Jambalaya. Today we're leading the charge into the great state of Louisiana. I'm sure you've got great stories to share, leave your comments here, or better yet, join the lively discussion over at "What Makes Your State Great?" on Facebook. The world famous "Mardi Gras" is celebrated in New Orleans. 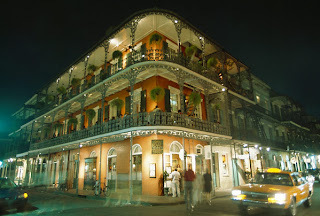 Mardi Gras is an ancient custom that originated in southern Europe. It celebrates food and fun just before the 40 days of Lent: a Catholic time of prayer and sacrifice. Breaux Bridge is known as the "Crawfish Capital of the World". 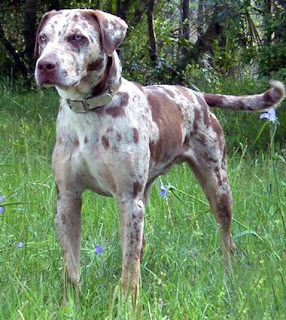 The Catahoula Leopard Dog, often called the Catahoula Hound, is the official state dog. The city of Kaplan is referred to as "The Most Cajun place on earth". Mamou bills itself as "The Cajun Music Capital of the World." Mamou musicians, in particular the musicians who have perform at Fred's Lounge have been a major force in expanding the audience for Cajun music far beyond Southwest Louisiana. You can't talk about Louisana Cajun Cooking without talking about Justin Wilson. One of the original celebrity chefs. Many many years ago I used to watch Justin on PBS. Here's a sample of his amazing work. One of the most exciting things for me about Louisiana is The Myrtles Plantation. I've seen many "Ghost Hunts" there and from the pictures and recording I believe The Myrtles is indeed haunted. I found this great video on baskets by John Darden on the Chitimacha Reservation, Louisiana. To me Louisiana is about love, family and friendship. Sending love and protection to the great state of Louisiana.